For small tactical units there is another option in force protection, elusiveness. The state of being hard-to-kill means being so elusive that you become a hard target to, well…target. Elusiveness is achieved through either mobility or stealth. One or the other, at least in terms of land forces. True, aircraft achieve an element of both, though primarily they use mobility. Fast moving aircraft are difficult to shoot down even when we are completely aware of their presence. Still, aircraft do employ stealth technology from electronic detection, and can always fly into cloud cover (when available) to avoid visual tracking. The reverse is true for submarines. These vessels use underwater stealth as their primary form of elusiveness, though indeed submarines can achieve fairly impressive speeds, at least in terms of watercraft. Land-borne forces do not enjoy such a blurring of the line. 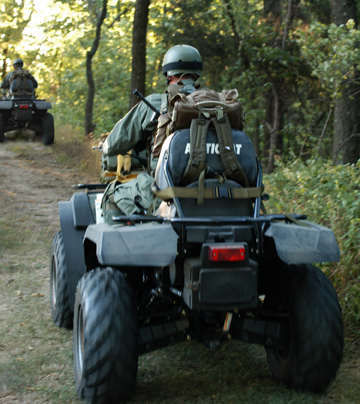 Vehicles move humans quickly across the terrain. But vehicles are also large and loud, easily seen and easily heard. This is reasonably true even for the smallest land vehicles such as motorcycles, and also true for large armored vehicles such as the Stryker. And lest we fall into the trap of thinking some semblance of stealth can be achieved with airborne vehicles – nope. Blackhawk helicopters and Osprey hybrid fixed wing vehicles are easily seen and heard, too. I’ve spent a respectable number of years in both air assault and mechanized infantry regiments. In all those years I’ve never had a vehicle “sneak up” on me. Yet the noise and visibility of combat vehicles shouldn’t be interpreted as malfunction or deficiency. Regardless of the ease of detection, combat vehicles offer fantastic advantage to their passengers and crew. There is some protection from projectiles zipping about the battlefield, even in relatively thin-skinned vehicles. The weaponry and munitions that vehicles carry when compared to dismounted troops is nothing less than awesome. And perhaps most importantly of all is that such vehicles offer mobility. It’s not merely the difficulty in targeting and scoring a hit against a moving vehicle, yes that’s difficult enough. But it’s also that mobility, more specifically speed, allows these forces to quickly move out of gunnery range or at least rapidly find suitable cover. This attribute alone can render powerful, sophisticated weaponry ineffective, or even obsolete. Even when excellent gunnery is capable of scoring hits against highly mobile forces, the impact is usually minimal. Yes, a vehicle is almost certainly lost, but the passengers and crew are quickly swept up by another vehicle and the mobile force continues on its way. Think of the cavalry during the American Civil War. Even when the foot soldier managed to down a horse, the horseman almost invariably jumped onto the back of another cavalrymen’s horse and away they went. This had to be incredibly frustrating to the infantrymen who had to withstand the pulsing attacks of highly mobile mounted troops. The same dynamic exists today. Watch the videos of the Taliban cheering while standing on a burnt-out hull of a Coalition Forces vehicle. How often to you see the bodies of Coalition Forces in those videos? Almost never. Yet you can bet if the Taliban could show off the bodies of their dead enemies, they most certainly would! So instead the Taliban are left with little option but to make a “big show” of a burnt vehicle, while they lose more and more of their warriors to highly mobile Coalition Forces every day. That has to be frustrating for the enemy. Mobility is a form of elusiveness. Stealth, then, is the other form of elusiveness. And when we think of elusiveness, we tend to immediately think in terms of stealth. 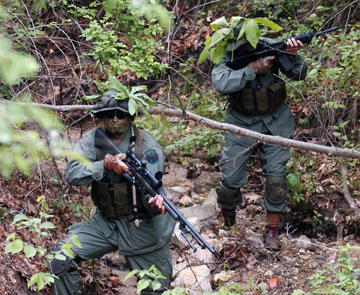 Heavily vegetated forests and jungles, or forbiddingly steep mountains are ideal terrain to achieve stealth. The physical dynamics of flat, open terrain lend well to mobile forces while playing a distinct disadvantage to forces employing stealth. It’s not necessarily the case that a small tactical element couldn’t be stealthy in their approach across a desert plain. But it is much more difficult to achieve success in this effort, and if the stealthy dismounted force were detected in open terrain by a mobile force, their doomed fate is sealed. Modern technology hinders stealth in such terrain all the more. Passive light night vision devices and the impressive Forward Looking Infra-Red (FLIR) detect the human form with great reliability. Again, this is not to overstate the crutch of technology. When employing stealth, the clever use of a defilade waddi or ravine can be used to avoid detection. Furthermore even FLIR has its limitations. In the hottest part of the day the desert floor becomes so heated that a human body is able to “hide” in the FLIR image. It’s like hiding a needle in a needle stack. And in the snow covered tundra, ample use of snow banks and drifts can achieve a similar effect in hiding the elusive force from the peering eye of FLIR and passive light detection. Still, the use of stealth is better suited to vastly vegetated terrain where a stealthy patrol isn’t canalized into natural chokepoints to become easy prey for passive light and FLIR detection. Stealth is slow. Speed is not the objective, nor can speed be counted on as a form of security during stealthy patrolling operations. Stealth relies instead on camouflage from enemy detection, and maintaining an upper hand in situational awareness. We need to know where the enemy is, and isn’t, while keeping the enemy confused as to our location. This is critical. If the enemy detects us they will bring their firepower to bear, of course. That might mean the enemy employs highly mobile troops using direct fires, and yes, Close Air Support (CAS) is included in this. It might also mean indirect fires of the enemy’s long range mortar and artillery. In any case, detection can be fatal to a stealthy, slow, dismounted patrol. In Vietnam during the late 1960s, US battalions of the 187th Rakkasan Airborne (ABN) regiment and the 199th Light Infantry Brigade (LIB) were tasked to interdiction operations against infiltrating elements of the North Vietnamese Army (NVA). Regiments of NVA Regulars were using the Ho Chi Minh Trail to gain access to the porous mountain border of Vietnam and Cambodia, and into the triple canopy jungles of the central highlands. The 187th Rakkasans and 199th LIB took two very different approaches to the problem, though arguably both were equally effective. Knowing the enemy employed artillery and mortar fires from entrenched safe havens unevenly dispersed throughout the central highlands, both the 187th and 199th dispatched rifle companies to conduct ambushes and deliberate attacks against enemy formations. Common to that conflict, rifle companies were often undersized at just 90 to 100 troops instead of the allotted 140. The 187th Rakkasans chose to use a stealthy approach. They would enter the jungle valleys from firebases or by means of helicopter insertions, making use of ample false insertions to confuse the NVA as to the actual location of the rifle company. Once in, the Rakkasans would ever so slowly snake their way through the valleys and mountain ridgelines to an intended target. The patrol would take days, sometimes a week or more. Progress was painfully slow. The pointman as well as every troop in the linear formation had to make a hundred decisions and assumptions every day. Do you move to the sound of the water? The troops need to top off canteens, but water brings unwanted enemy traffic. Do you move to the sound or smell of enemy encampments? If this is not the rifle company’s intended target, an early engagement would disclose the rifle company’s position and put it in a fight before it could get to its target. Yet, tracking and shadowing a small enemy patrol might also lead the rifle company directly to its intended target. Each Soldier stepped carefully, deliberately. The enemy laid mechanical ambushes just as we did. Booby traps lined the foot paths. It was best to avoid those. Each Soldier moved vegetation carefully around them. To snap branches or clumsily shove at vines would make unnecessary noise and invite the attention of enemy patrols. If discovered, the Rakkasans could expect a hailstorm of indirect fires from entrenched enemy artillery and mortars – or worse, an assault wave of the nearest NVA battalion. Each Soldier carried what they’d need for three to five days at a time, food, water, ammunition, batteries, and medical supplies. Equipment had to be secured, tied and taped. Radios had to be muffled with socks and plastic wrap. Hard surfaces softened so as not to make so much noise. Camouflage grease was applied to skin and shiny metal objects. Often even the baggy portions of trousers and blouses were wrapped tight with friction tape. It was heavy going in such hot, humid conditions. A 100-troop rifle company would stretch for 300 meters through the mountain jungles. Though most days a rifle company would travel on average one to two kilometers, some days they only moved 100 meters. This meant the Soldiers in the back of the column pulled guard that night in the very same positions the Soldiers at the front of the column had used the night before. Within a week’s time, the Rakkasans would have moved perhaps five kilometers. They then sprung an attack on a very unsuspecting enemy. The rifle company could call for fires from its own artillery emplacements, and if the target was marked clearly enough the rifle company might even risk CAS in the triple canopy jungle. The attack or ambush was almost always quick and clean. Few of the enemy survived to offer much information to sister NVA battalions. And typically by that time the Rakkasans had slipped away into the jungle, stealthy and elusive. The 199th Light, by comparison, would have nothing to do with that sort of fighting! Even though the 199th was also on foot, they chose an altogether bolder approach to engaging the NVA. They would march. Each morning prior to the patrol the 199th rifle companies would palletize their gear. And not just the mortars and recoilless rifles. No, they’d palletize their rucksacks, body armor, plus extra water, C-Rations and ammunition to be flown out each morning, sling-loaded by helicopter. When a light rifle company started to march, the troops carried a single meal for the day and water. Beyond that it was just radios, weapons and ammunition. The light rifle company could easily cover a dozen kilometers in a single day, provided they didn’t come in contact with a sizable enemy force. The 199th Light companies marched a dragnet across the central highlands, daring the NVA to put up a fight in broad daylight! The 199th Light could rely on almost instantaneous artillery and CAS support when in battle. And when the 199th rifle company stopped each evening to hunker down in a temporary, nighttime defensive perimeter (NDP), they marked a landing zone (LZ) for the helicopters. Pallets of rucksacks, body armor, mortars and recoilless rifles came in with extra ammunition, batteries, medical supplies, meals and water, plus sandbags, lumber and spools of concertina wire. Yes, the enemy might send an artillery barrage and assault wave against the 199th rifle company at night. But the 199th would be prepared for it. Besides, with such incredible mobility through the jungle, the 199th Light could match or even outpace NVA regiments. It was immeasurably difficult for the NVA to gain and maintain contact with the 199th during the daylight march. And so the sheer mobility of the light infantry rifle companies meant that they often walked beyond the range or detection of the NVA artillery! In this manner, the rifle companies of the 199th Light used mobility to chose the time and location of their fight with the enemy. This elusiveness gave the 199th an awesome advantage in battle. Two different approaches – the stealth of the 187th Rakkasans and the mobility of the 199th Light. Yet the rifle companies of both of these units managed to achieve elusiveness. And that spelled tactical success at the small unit level.